How would you feel if you shot twenty five strokes under par in a golf tournament and you didnt win it? Regardless of how many holes you played, wouldnt you feel a little bit goofy? You can get a not-so-goofy answer from Chip Beck. Chip Beck is a professional on the PGA TOUR who just happened to shoot twenty five strokes under par at the Walt Disney World Golf Classic in 1988. I say just happened, although scores like that just dont happen very often. They are a very rare happening, and when they do happen you would think something good would come of them. Not so for Chip Beck; some other guy shot the same score and beat him in a playoff. Now wouldnt that make you feel a little bit goofy? Goofy scores, goofy guys, goofy outcomes....they are all there at the Walt Disney World Golf Classic, and the only other thing you really need there is Goofy himself. That would just make your day, wouldnt it, Chip Beck? But of course, Goofy is to Walt Disney as Rub o th Green is to golf. If they arent there, then something is missing. I grew up with Goofy at the same time I grew up with golf. I dont imagine many readers remember the old cartoon in which Mickey Mouse is playing golf and Goofy is his caddy (who else?). They go along pretty well over the first few holes until Mickey finds himself in a very deep sand trap cut right into the edge of a large green. He asks Goofy for his sand iron, takes a huge swipe at the ball, sends up a shower of sand, but doesnt even move it. He takes another swipe: same result. He tries it a third time unsuccessfully, throws the club back at Goofy, and asks for a different one. Goofy gives him a mashie. Mickey takes a couple more swipes, sends up a couple more showers of sand, and throws the club back at Goofy again. Goofy gives him another club, then another club, then another. Finally, after almost all of the clubs have been used and almost all of the sand is out of the trap, Mickey asks for the putter. He takes a graceful swing, catches the ball cleanly, and rolls it over the edge of the green and into the cup. By this time, Goofy is lying prostrate on the ground - almost covered with sand - with broken clubs lying all around him. His eyes are bulging, his teeth are gnashing, and through it all he is muttering: ....its only a game....its only a game....its only a game! Are you listening, Chip? The Walt Disney World Golf Classic is played over 3 courses located within the Walt Disney World Magic Kingdom: The Magnolia Course, the Palm Course, and the Lake Buena Vista Course. The yardages for the professional players are, respectively: 7190, 6957, and 6655; the course ratings are: 73.9, 73.0, and 72.7; and, the slopes are : 133, 129, and 128. Concerning prestige on the PGA TOUR, this tournament is rated twenty-third, course difficulty is rated forty-third, and the overall rating with all factors evaluated (including quality of winners) is twenty-eighth. Not bad for a tournament which some jokesters might refer to as Mickey Mouse. Lake Buena Vista Course Taken together, these three courses have been described as ..almost as blue and white as (they are) green. There are an even 300 bunkers on them and an odd 25 lakes. And I understand that all of the flags are yellow, probably with the name of the tournament inscribed in logo. (Whatever became of red flags with white numbers?) If there were four courses here the four-round tournament would likely be played on a different course each day, but since there are only three, the cut is made after everyone has played the three courses and the survivors return to Magnolia. It must be a fine course, so let us examine it in depth. Number 1 is a par 4 of 428 yards with water all along the right side of the fairway and a trap on each side of the green. Number 2 is a par 4 of 417 yards, dogleg to the right, with eight traps. Number 3 is a par 3 of 160 yards with traps North, South, East and West circling a very round green. Number 4 is a par 5 of 552 yards with thirteen traps all over the place. Number 5 is a par 4 of 448 yards with three irregular traps surrounding a rather large green. Number 6 is a par 3 of 195 yards with a huge lake to hit over from the tee to a kidney shaped green which is quite undulated. Number 7 is a par 4 of 410 yards with a lake to hit over from the tee again and three traps to hit over to get on the green. Number 8 is a par 5 of 614 yards, dogleg left, with six traps around a kidney shaped green for the third shot. Number 9 is a par 4 of 431 yards with a big lake all along the left side of the green. Suffice it to say that the back nine is much like the front nine with very similar features. An obviously goofy feature of this tournament is the annual Hummingbird Bass and Golf Contest which teams sixteen professionals with sixteen fishermen. The twosomes play the back nine of the Palm Course (golfers through the fairway and fishermen through the greens), after which everyone goes fishing. Every golf stroke is then subtracted from all the weights of all the fish caught by each team, so it really turns out to be a low score big weight competition. Is it better to be a good golfer, a good fisherman, or both? As with most things, probably a little bit of this, a little bit of that, and a little bit of luck besides. Finally, when Chip Beck plays in this tournament this year, I know of a funny looking guy who would make the perfect caddy for him in this goofy tournament. He has long, floppy ears, a bulbous nose, and very big feet. But the best thing about him is that he will do anything you ask him to. 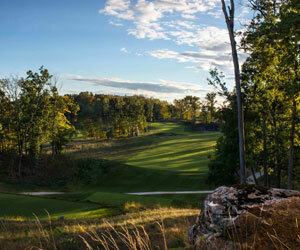 Wild Rock / Wilderness Resort golf packages - One Round is Never Enough!